In continuation of our Beginners guide series, this guide is all about controlling your HTPC. One thing that sets a “computer connected to your big screen” and it being a HTPC is how we interface with the system. Controlling your HTPC is all about the hardware and software combination you are using. Depending on if you are using the plethora of HTPC software front ends whether it be Windows Media Center, Sage TV, Beyond TV, Myth TV, Boxee, XBMC, you name it they all require hardware to interface with it to control how it works. For more information on the aforementioned software stay tuned for the Beginners guide to HTPC software. Now that you have read what a HTPC is and what it entails now the fun begins in how to integrate it into your entertainment setup, and how to control it out seamlessly. There are many ways to control a HTPC, it is as simple as using a traditional keyboard and mouse to as crazy and sophisticated as using home automation software and integrating TCP/IP commands to control your entire setup, stay tuned for the Beginners guide to home automation also see the HD Sports Bar setup. In this guide we will cover every aspect of HTPC controls to allow you to make the best possible decision on how you personally want to control your HTPC setup. Most keyboard and mouse combinations are more oriented for desktop use and not for on the lap lean back couch use. The ultimate goal for most HTPC enthusiasts including myself is to never need to use a keyboard and mouse and only use a remote control.However there is still a select few that prefer this method so I have to include that in this guide. In the world of keyboard and mouse setups there are a variety of technologies out there. Wired USB is the most common, and depending on your HTPC installation might be the most cumbersome option running a 25 foot USB extension cable across your floor isn’t the most clean looking solution. There are plenty of wireless keyboard mouse solutions. Some of the wireless technologies you can find out there include Infrared (IR), Blue Tooth (BT), and Radio Frequency (RF). All three technologies have their advantages and disadvantages. With the advent of Blue Tooth and RF remotes it is very rare to find IR keyboards any more so we will skip that as a viable option. While IR has one huge advantage over RF and Blue Tooth is that you won’t experience interference issues with IR like you can with RF based keyboards. Nothing can beat the reliability of a hard wired USB keyboard and mouse but as mentioned already trying to hide that cable and avoid running it across your floor might be too difficult. 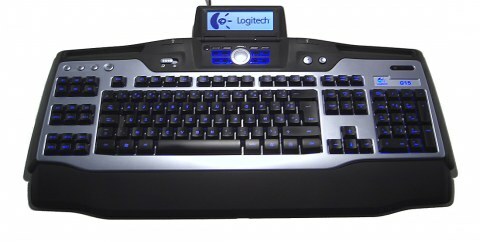 As already mentioned there are a few different solutions when it comes to wireless keyboards. Blue Tooth (BT), Infrared (IR) and Radio Frequency (RF). Radio Frequency keyboards are similar to Blue Tooth while they both are 2.4 GHz the chipsets they user a vastly different. Generally Blue Tooth has a limited range of around 30 feet. While 2.4 GHz RF keyboards can go farther depending on the manufacture. 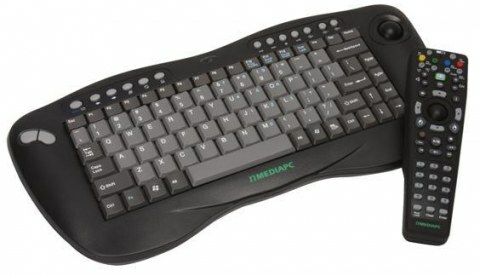 The nMedia PC RF Keyboard features an integrated track ball, has a remote control paired with the combo, and used the 2.4 GHz spectrum. 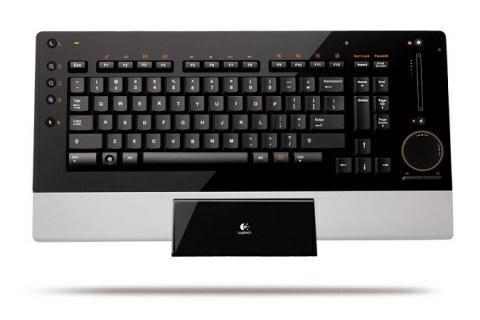 Another interesting keyboard, albeit expensive, the Logitech DiNovo Edge. With integrated track pad. A Blue Tooth based keyboard, similar to the nMedia above, comes with a USB dongle that connects to your pc. 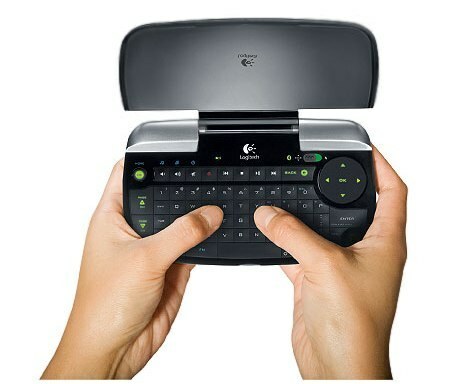 Finally what I would consider one of the best compromises for keyboards and HTPC use, the Logitech DiNovo Mini. So there are a few ideas for some keyboards you can use to control your HTPC. While some are more HTPC oriented than others, in the end they will all get the job done. One of the more common methods for controlling your HTPC is with a remote control. Like any other entertainment devices, a remote control is by far the easiest and most universal way of controlling your HTPC. There are a few things you need to consider before going the remote control route. First as mentioned above you need to first decide on a HTPC software platform. Once you decide on a HTPC platform your choices for remote controls vary. The main thing behind using a remote control for your HTPC is weather or not you are going to be using an Infrared (IR) based remote control or Radio Frequency (RF) based remote control. Both solutions have their advantages and disadvantages. Infrared (IR) is the most common and universal control medium. Virtually every piece of consumer electronic device is controlled via IR. The down side to IR, that I am sure everyone is aware of is line of sight, you need to be able to aim your remote controller towards the piece of equipment you are trying to control. Radio Frequency (RF) on the other hand doesn’t require line of sight. With an RF remote control you can be in a completely different room and still be able to control your HTPC (as long as you have signal). With IR based control medium you can use programmable universal remote controls such as those available from Logitech. The down side to RF remote controls is that you do not get the advantages of universal remote controls. So now you’ve built your HTPC, and are ready to control it with a remote control, you’ve decided to go the Infrared (IR) route as you want to use your Logitech Harmony remote control so that you can integrate it into your entertainment setup. One thing a PC doesn’t have is an IR receiver, a sensor to pick up and translate those IR commands from your remote to manipulate the HTPC software. Say you are using Sage TV or Windows 7 Media Center. One of the most obvious choices is the plethora of pre-branded Media Center USB IR receivers which almost every manufacture for HTPC peripherals make. 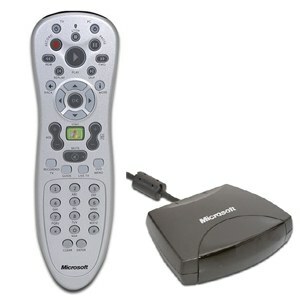 The Microsoft branded USB remote and IR receiver is one of the most common setups out there. Out of the box both the Microsoft and the Amulet Devices USB IR receivers are a plug n play device with Windows 7 Media Center. There is no additional software that needs to be installed. No additional Drivers. The Microsoft Media Center oriented USB IR receivers are unique as they have a “pseudo” main stream platform they are developed for. One of the most talked about and used USB IR receivers which is also an IR blaster (more on that later) is the USB-UIRT. The USB-UIRT is a universal devices that is supported by HTPC software such as Sage TV and Myth TV. Now that you have USB IR receivers taken care of, it is now time to focus on remote controls. Most USB IR receivers come with a matched pair remote control, such as the Microsoft USB IR receiver and remote. Will most of the remotes we will focus on are IR based there are some RF based remote controls. These RF based remote controls come with specialized software that runs on your HTPC, comes with a USB dongle, and the remote itself. The great feature about these remotes is not only can you control your HTPC from outside of your media room you get additional features like mouse gestures, and voice control. There are two remotes from Gyration brand of remotes. They have the Media Center AIR remote and their Air Music remote. The other option, which is the most common option is universal remote controls. 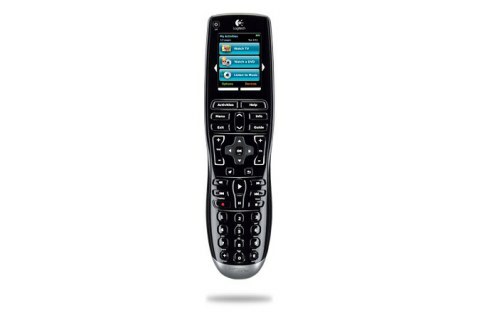 Logitech Harmony line of remote controls are one if not the most common universal remote control. The great thing is Media Center and other media software IR codes are available in the Harmony data base so it is very easy to program the remote and get up and running. None of these remotes come with an USB IR receiver so you will need to pair these remotes with one in order for them to work with your HTPC. So now that the foundation is laid, you should have a better understanding of how you can control your HTPC in a variety of applications. Now go out and figure out what the best solution is for your HTPC setup. The gyration remotes are excellent products. Too bad they have been discontinued by the manufacturer. Love the familiar feel of the IR remotes, gotta say it feels nice and its good for people sharing too (dont want my dad to have to fiddle with a keyboard). But for every day use I still like my Loftek M-Click, it doesn’t have too many functions but its reliable and convenient. Well-written guide! Other options are using smart phones and tablets. I just installed PCRemote on my Android phone and was plensantly surprised the functionality it had like: mouse pad, keyboard, dedicated screens for meedia playback and PC shut down options. It uses bluetooth or wi-fi to connect to a lightweight server on the PC. This would be a good topic for someone at Missing Remote to do a review on if it hasn’t already been done. There are a few different software programs that have this type of functionality. For me it’s not for troubleshooting, but for online streaming. There’s still plenty of online video websites which don’t have a 10′ interface, so hence pulling out my trusty dinovo mini is a necessity in my house. ESPN3.com is a perfect example–i know i could switch to my XBox360 for the 10′, but until then, kb/mouse is super fast. Currently, our main TV serves double duty as the main computer, as well, so there’s a LOT of web browsing going on. whoa, seriously? How’s that work out for you? I actually know a few people that do the same thing. I personally couldn’t do it but people do it for some reason. I’m more curious how it works. So do you have a monitor connected to it as well as the TV? And then you just can’t use the HTPC-abilities? So then i’m assuming you’re not using your HTPC for TV watching then? Wow, I never expected that one sentence to get such a reaction. LOL! We used to have 3 computers in the house. One for the wife, my own, and the HTPC. Hers died and she never got around to getting it fixed. In reality, she bought the parts, but I refused to fix it and told her I’d teach her how to build one from scratch… which never happened. (Recycled the parts for rebuilding the HTPC actually.) My computer died not all that long ago, but it hadn’t been used in about 9 months at the time. Reason? We’re usually together in the TV room. We don’t have kids (2 Shepherds, mind you) and neither of us are gamers. To directly answer questions, no, there’s no double duty here. When someone’s watching TV, you can’t “use the computer” and vice versa. With only the two of us in the house and considering we normally do things together, there’s generally never a conflict. Even if there is, “Honey, can I (or you) look something up real quick?” isn’t exactly a rage-inducing affair by interfering with my watching an episode of Sanctuary. Most often, we watch the same shows together, anyhow. The only time I can recall this being an “issue” was when the wife didn’t think to cover her tracks when searching out a gift for me. I wasn’t snooping, but I regularly search my own browsing history for sites I visited and I happened upon a sequence of searches I knew I hadn’t done. It was pretty obvious what it was. I told her and now she either does that during her lunch break at work or uses IE, since I never do. That said, I do intend to get my other computer up and running soon since there are times when 3 24″ monitors are better than a 50″ plasma, especially when I’m working on certain things. i see…interesting 🙂 thanks for the explanation. I still love the original MS branded remote. It has the “wife-factor”. I also have a Harmony One and I could train the wife to use it, but I am not in a position to buy 3 more; one for each of the extenders. For her it is important to be simple and work. The MS remote has a minimum of buttons and controls all functions of MC (with the exceptions of some plugins). It was easy for her to get up to speed using and it was reasonable to purchase one for each extender TV, too. I have other remotes for me and the work I do on the MC PC, but I only pull them out when I need them. I agree that nothing beats the original MS remote. I tried harmony, and some others, but nothing comes even close. ebay is your friend. I just bought two a couple weeks ago. I am creating a stash. I get them at around the $10-$13 range. it won’t be long until they are much higher. The remote version that can control TV power and TV volume is hard to find. That is the only kind I buy. I just keep a running search going on ebay. Like I said, I bought 2 a couple weeks ago and let another go by last week. Just have to wait them out. Another one got listed today with receiver on ebay. It will go quick. I spent two hours wroking on my Logitech remote last night and I still have some bugs. At first it was like 1 or 2 and I’d fix thwem to have another pop up. Right now I have a problem where the PC gets shut down even though I have it set to be left on everywhere I could find that setting. What I think might be happening is that I have the remote set to turn off the XBOX when not in use and I am beginning to think that the power toggle command might be the same for both. Perhaps i can go into the local security policy to avoid being shut down. Another problem that came up was that I had an option to move to the movie option via a command in the Logitech software. Then I put in a sequence to move left and select OK which would open Netflix. It worked great until a message popped up that there was an update for my XBOX 360 settings. After that it borked my sequence to the point where it selected movies and then I could see the screens being changed per the sequence. There is a code to go to the start screen but it only goes to the top level. e.g If I am in musicartists it would take me to the start screen but focus would be on Music. Now if I press home on the keyboard it sets the focus to extras but there is no home option on the remote. So close yet so far away. I wish I could browse the available commands for each of the several MCE devices that Logitech has as a choice. The PC and Xbox power commands are compatible. I have the Microsoft remote and sensor for my HTPC. I also have a Linksys DMA2100 with a remote. And I have an Xbox 360. Both remotes will control all 3 devices out of the box. Including the power button. I love it! The power button is the issue with the shared remotes. I have to set all devices to stay on and let the XBOX timeout after an hour. I leave the PC on all te time because if it powers down it doesn’t power up automatically and I have to manually turn it on. And even though it is just coming out of sleep it takes 30-60 seconds before it initializes the USB receiver and Ceton tuners. My next hope is that MS has discrete powewr on and power off IR codes and that I can try to use those. That way if the system is set to power on the Media center and it send a power on code all will be good as opposed to a power toggle code that will turn the pc off if the last state was that the PC was on. There are discrete codes for power. I use them with a Harmony One.